India is a land of rivers, and where there are rivers, there will inevitably be boats and crossing places (tirthas) to assist travelers on their journeys. Tirthas are often revered as holy places associated with a saint or deity, and many tirthas are pilgrimage sites. Indian literature is rich with imagery involving boats and crossing water. Poets envision life in samsara (the world of senses and illusion) as the journey of a small craft across turbulent water, with God or spiritual practice as the skillful navigator who ferries us safely across. When Rama and Sita were exiled from their kingdom, they wandered at first. Accompanied by Rama's brother Lakshman, they traveled to the Ganges, the great mother of all rivers. There on her banks, they sought a shallow place to cross—a tirtha. Soon they spotted a ferryman waiting by the shore with his small, open boat, gazing peacefully at the water. “Hey, Khevat!,” they called, “will you take us across?” Khevat (the name just means “boatman”) looked up sharply. “Who's asking?” he said. Rama knew what Khevat was referring to. In the forest he and his companions had encountered the lady Ahalya, who had been turned to stone ages before by a jealous rishi and then restored to warm life by the touch of Rama's foot. Clearly, that story had spread. 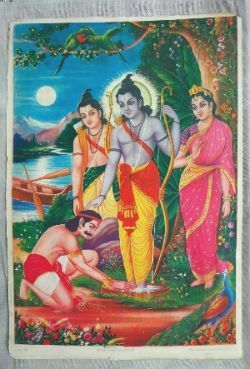 After prolonged negotiations, Khevat agreed to carry the three wanderers to the other side of the river—but only if Rama would permit him to wash the dust from his feet and bow down to them. (In truth, this was what Khevat had wanted all along; all that about being afraid his boat might turn into something else was just a ploy to be allowed to touch Rama's feet.) Once they reached the other side, Sita offered her ring in payment. “By no means,” said Khevat, “Lord Rama, tum bhi Khevat—you and I are brothers in the same profession. I carry people across the river, but you carry them across the ocean of samsara—your name alone is enough to assure safe passage!” Once more, Rama allowed Khevat to touch his feet, and then the three walked on. In this story, we see the symbolic importance of the avatar's feet. They are the point at which the divine energy connects with the earth, providing a link—the human body—between earth and heaven. The touch of Rama's feet liberated Ahalya and transformed her from her “stuck” state, while Khevat, intuiting the power of those feet, wished only to wash them and place his forehead on them. In India it is common practice to show respect by touching the feet of a revered elder, such as a parent or teacher, and the feet of spiritual leaders are seen by many as objects of veneration. 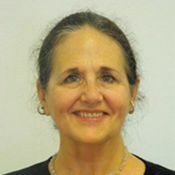 You might even say that the feet of a real master are both a tirtha and a boat—both a place that helps us cross from our ordinary state of confusion and entanglement over to the spiritual realm, and the vehicle that takes us across. Sit on the floor, on the front edge of your sit-bones, with your knees bent and the soles of your feet on the floor. Hold your shins, just below the knees. Lift your chest. Lift your toes and begin to shift your weight back (toward the back of your sit-bones, but not so far that you roll onto your tailbone); keep lifting your chest, and begin to loosen your grip on your shins. Don’t extend your arms yet. Lift your heels, balance on your sit-bones (and continue to lift your chest!). Bring your shins parallel to the floor, and extend the arms straight forward. Your arms are the oars. Reach forward, then plug the tops of the upper-arm bones into the shoulder sockets, and extend through your fingers. Draw your low belly in and up. On an exhalation, straighten your legs, lifting your feet to or above eye level. Keep lifting your low belly. Stay for a few breaths. Your spine is the mast, your legs are the sail. To exit the pose, bend your knees and place your feet back on the floor. Navasana resembles a dhow, a traditional Indian boat with a mast and a high, nearly triangular sail. Be careful not to round your back. Keep your deep abdominal muscles engaged so that you're not over-relying on your legs and hip flexors. For people with low back issues, a bent-knee or supported navasana is probably a better vehicle. This pose requires strength and concentration. It can be done with the soles of the feet on the wall to both help with balance and to provide support when the back and/or legs are weak. Another modification is to hold the backs of your thighs with your hands until you can extend your arms and legs. If you still find this pose difficult, ask your teacher for additional suggestions. What helps carry you “to the other side” of this pose? You begin with the feet on the floor, on the riverbank, as it were, and end in the same way. In between, your body lifts, it may sway, and you need to guide it. Observe your breath throughout. Can you keep it steady and your gaze calm even if the journey gets rough at times? Notice your eyes: are they hard with effort? Can you keep them soft, perhaps focused on your big toe-tips? Then, try mentally repeating “Ram” as you hold the pose. Does it help sustain you? Think about your life as a voyage. Where have you encountered rough water, rocks, obstacles? Did you have a yoga practice then? What has helped keep you “afloat” through difficult times?